Supreme Recovery Plus provides intensive nutritional support for the critical care of small herbivores and omnivores. What is Supreme Recovery Plus? 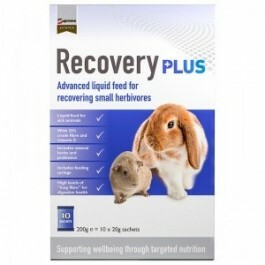 Recovery Plus comes in sachets that are rehydratable as a nutritionally complete liquid feed for sick or recuperating small herbivores. Just add warm water and mix into an easy to feed paste. It is based on Timothy Hay with high concentrations of long fibre, helping to support the digestive system, and contains high crude fibre (25%) to help promote gastro-intestinal health and aid with faecal consistency. The formula contains prebiotics to help promote the growth of beneficial bacteria for digestive health, and includes 18.5% protein to help boost protein reserves in times of greater need, and support the immune system. Anti-oxidants such as Milk Thistle has also been added to scavenge free radicals. With added Vitamin C (1,000mg/kg) to provide for higher requirements in stressful situations – no additional supplementation for guinea pigs or degus is required. Chamomile has also been included to provide support during times of stress, whilst the added Echinacea helps support the immune system. No added sugars or artificial colourants. What are the benefits of using Supreme Recovery Plus? What is in Supreme Recovery Plus? Dried timothy grass, alfalfa meal, dried alfalfa solubles, casein, dried peas, fructo-oligosaccharides, toasted soybeans, linseed oil, dried beet pulp, dicalcium phosphate, milk thistle seeds, dried Echinacea, dried St. John’s wort, dried chamomile (herbs 2%), salt, anise and fenugreek oil. Trace elements:Ferrous sulphate monohydrate 28 mg, calcium iodate2.3 mg, copper sulphate pentahydrate 19 mg, manganese sulphatemonohydrate 115 mg, zinc oxide 70 mg, sodium selenite 0.28 mg.
Vitamins:Vitamin A 23000 IU, vitamin C 1200 mg, vitamin D3 1400 IU,vitamin E 80mg. Gut flora stabiliser:Saccharomyces cerevisiae NCYCSc 47, 3×109 CFU/kg. Crude protein 18.5%, Crude fibre 25.0%, Crude oils and fats 5.0%,Crude ash 10.0%, Calcium 1.0%, Sodium 0.3%, Phosphorus 0.6%. How do I use Supreme Recovery Plus?